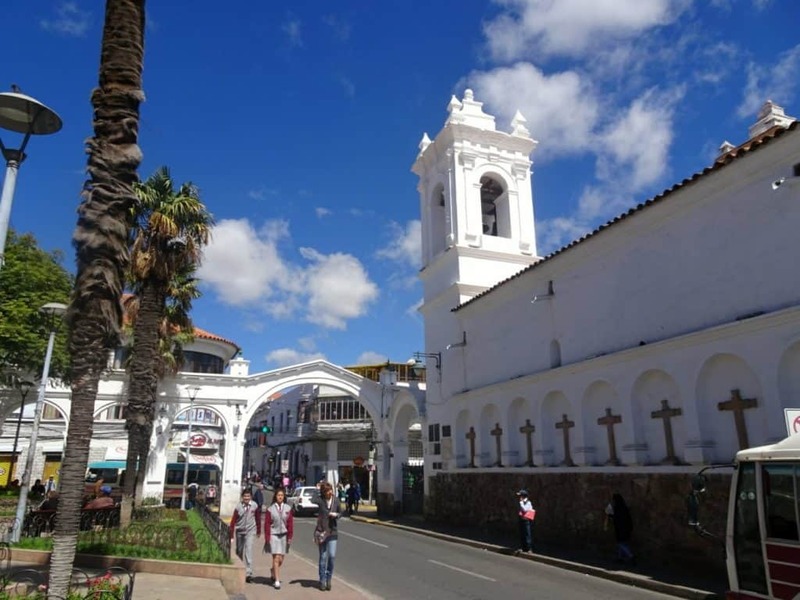 When you arrive in Sucre’s main square, you understand where this reputation to be an exceptionally beautiful city comes from. 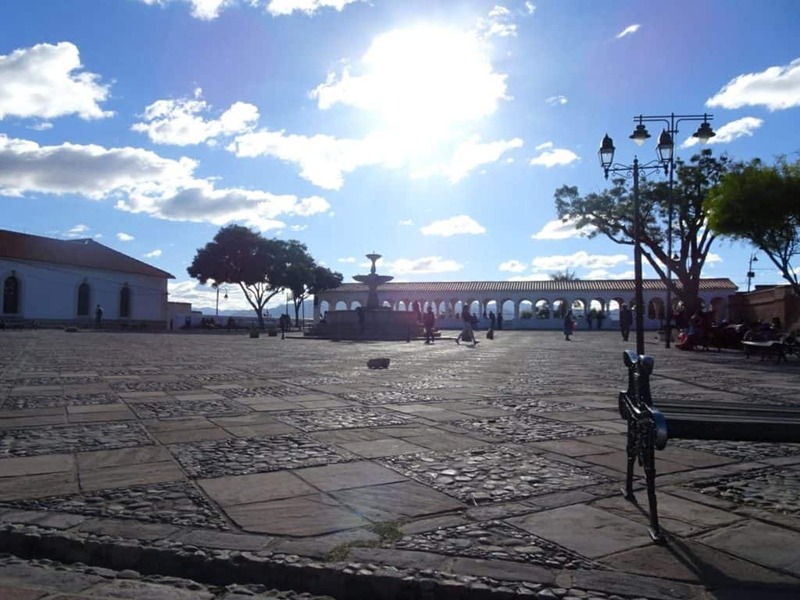 Sucre was one of the first towns in Bolivia settled by the Spaniards and thus features a lot of old, colonial buildings. 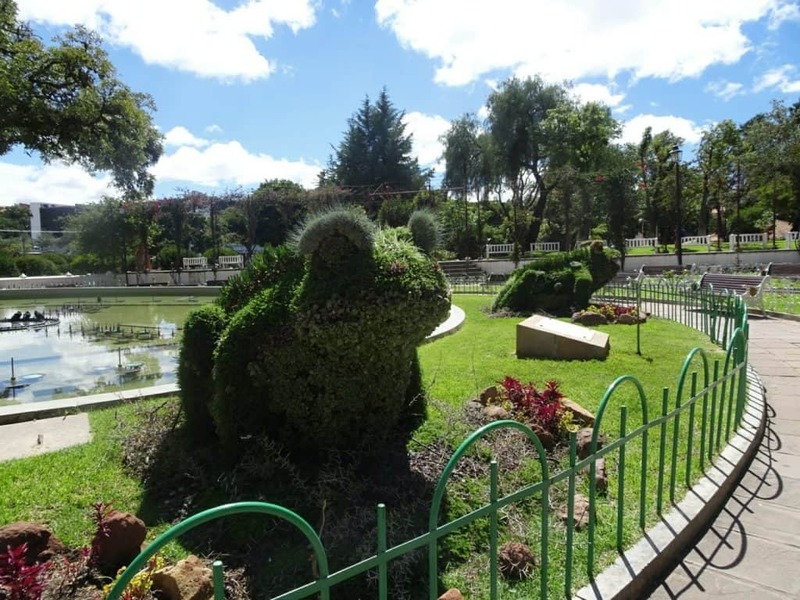 Some of the most beautiful are found around Plaza 25 de Mayo. In between those architectural jewels, you find some great cafes, ice-cream shops and restaurants. 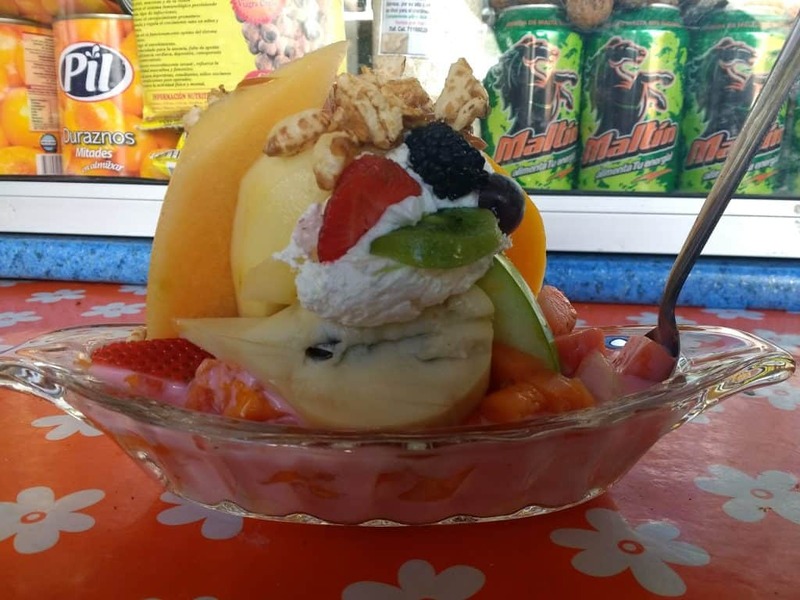 Try at least one of the flavours from the ice-cream parlour, or have breakfast at one of the cute cafes, while watching over the hustle and bustle of Plaza 25 de Mayo. It’s a great way to start the day. However, my favourite eating place in Sucre is not directly on the main square, but just one block off: Condor Cafe! You can go for breakfast, lunch, dinner or just an afternoon coffee. Their Vegetarian food is fresh and delicious, their prices absolutely affordable. They also have a small tour desk, so if you’re interested in day trips or walking tours of the city, you can book them right here. Best thing: As Condor is a community cafe, all profits go toward social projects. You can treat yourself and do something good at the same time! 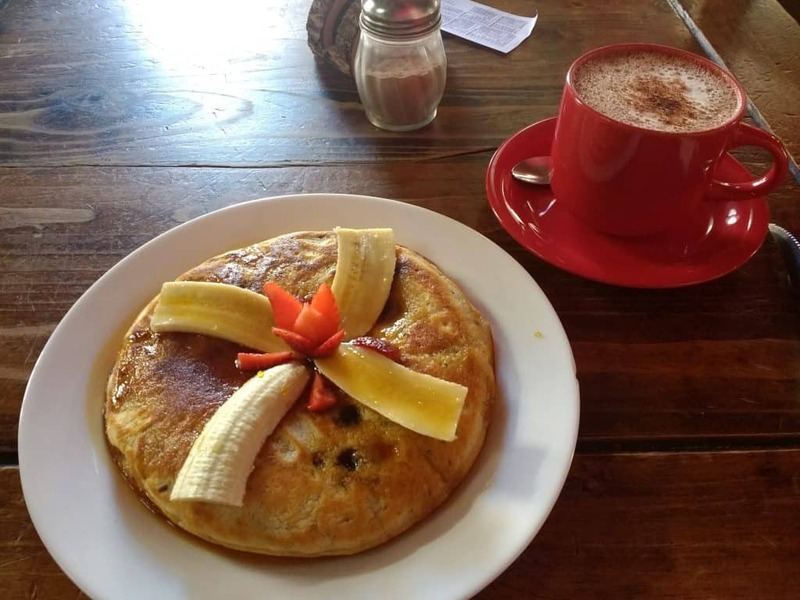 After having a good breakfast at Plaza 25 de Mayo, why not go straight to Casa de Libertad? 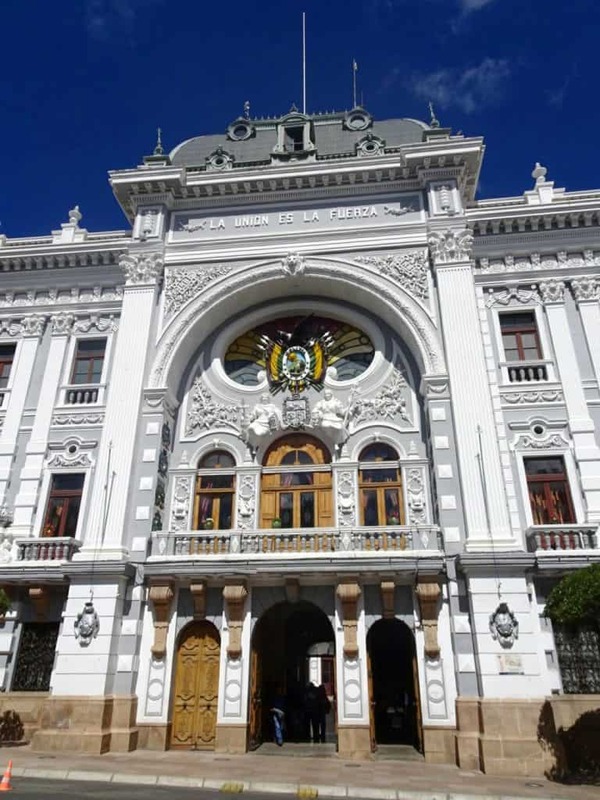 Situated on the Southern side of the square, this museum teaches you everything you need to know about the history of Sucre in particular and Bolivia in general. It costs a small entrance fee, but for that, you can join one of the guided tours in either Spanish or English. 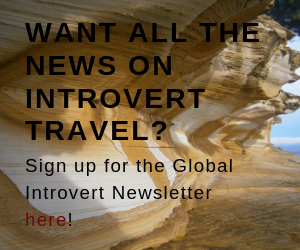 I strongly advise you to do this, because you will get so much more out of your visit. Our guide was great! 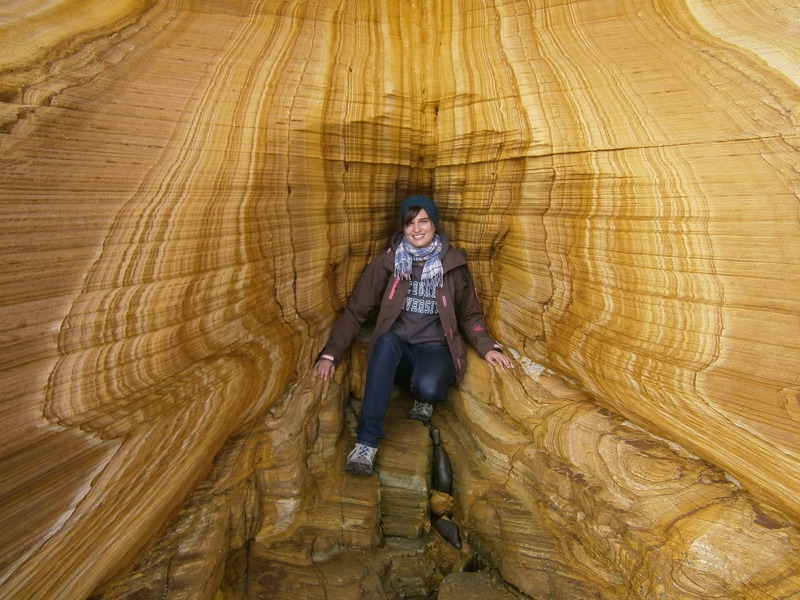 She showed us all around the place and made its history come alive. 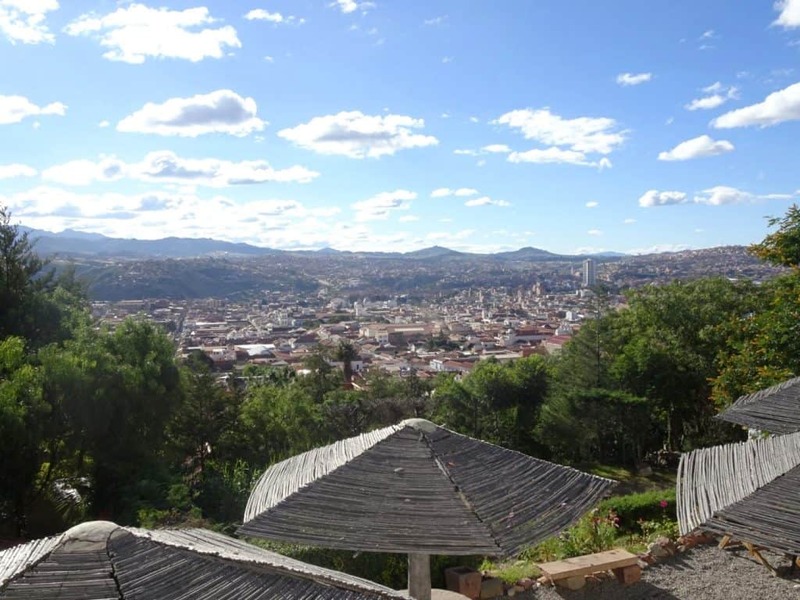 If you visit one museum in Sucre, make it this one. Sucre’s central market offers anything from fresh fruit and veggies over meat to clothing and household items. It’s great not just for getting cheap groceries, but also for grabbing a snack or quick lunch. Right in the centre of the market, there’s a section of stalls selling delicious fruit juices, smoothies and fruit platters with yoghurt and cream. The perfect afternoon snack on a warm day! Recoleta Monastery sits on one of the highest points of the city. 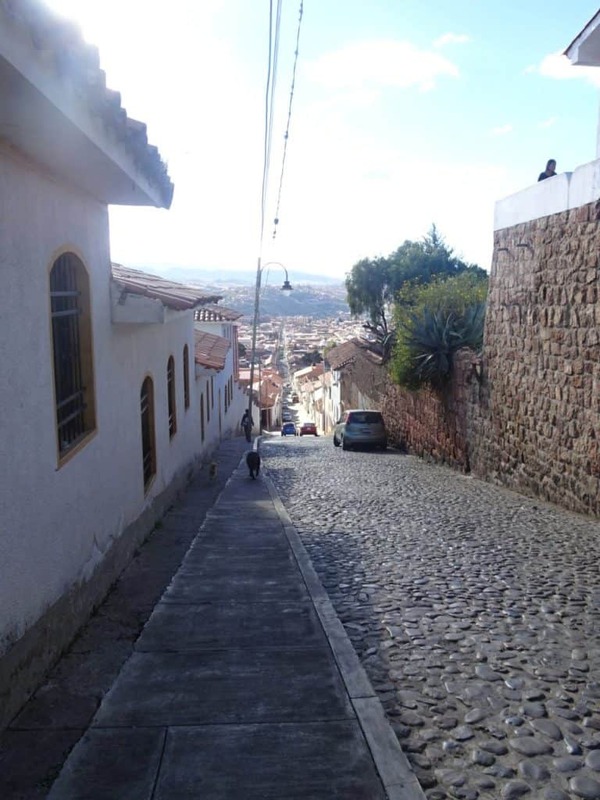 It’s a bit of a walk up there, but you will be rewarded with spectacular views over Sucre from the Plaza in front of it. If you come during sunset, it’s especially stunning. By the way, you can also visit the monastery itself, as it has been turned into a museum. The anthropological museum of Sucre, called Museo ASUR, is right next to Recoleta, so you can combine visiting these two. There’s also a small artisan market to go souvenir hunting. Several cafes and restaurants make sure you won’t have to watch the sunset hungry. 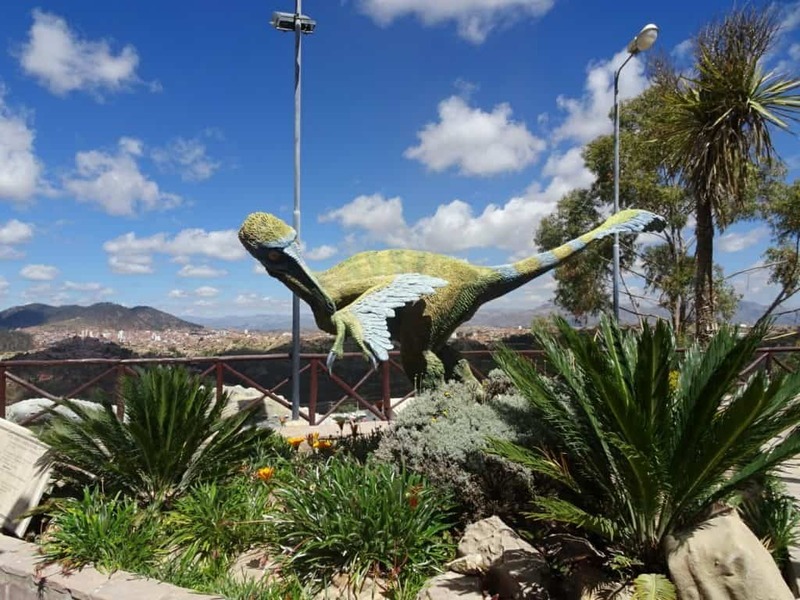 Commonly referred to as the dinosaur park, this is probably the most spectacular tourist attraction in Sucre. It’s a short way outside of the city, but you can catch the public bus for very little money to go there. 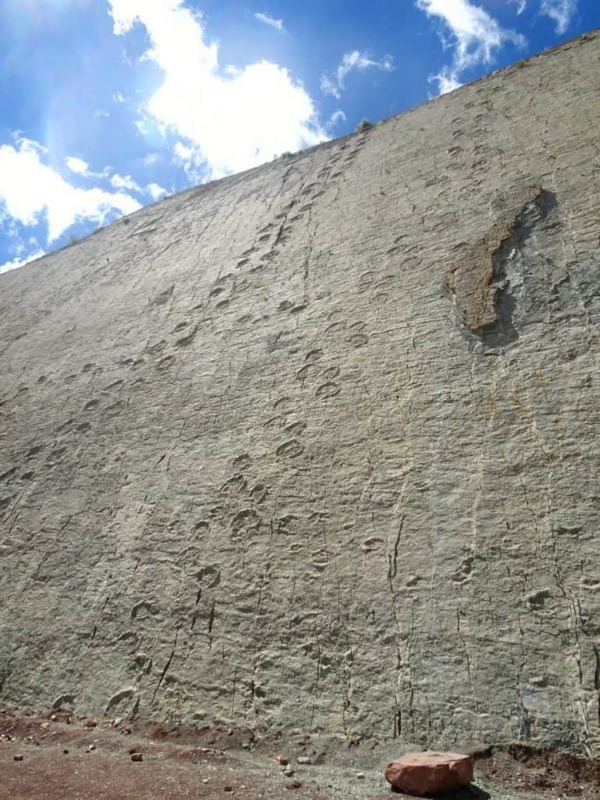 The main attraction of Parque Cretácico is a wall covered in dinosaur footprints. They’ve been left there millions of years ago during the dinosaur migration. 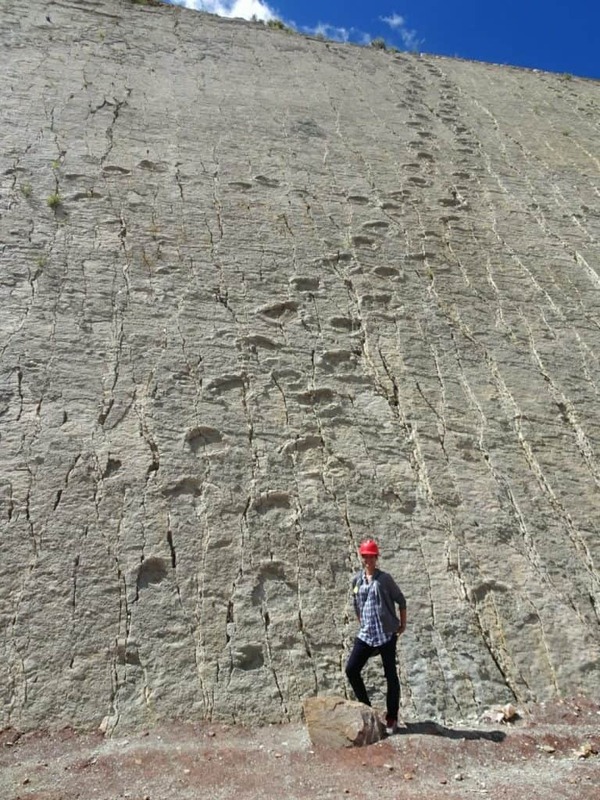 In the time since then, the movement of the earth has pushed the ground up so it’s now standing almost vertically – as if nature had intended to display those footprints for us. The wall can only be visited up close by taking a guided tour, but it’s included in the entry price to the park. 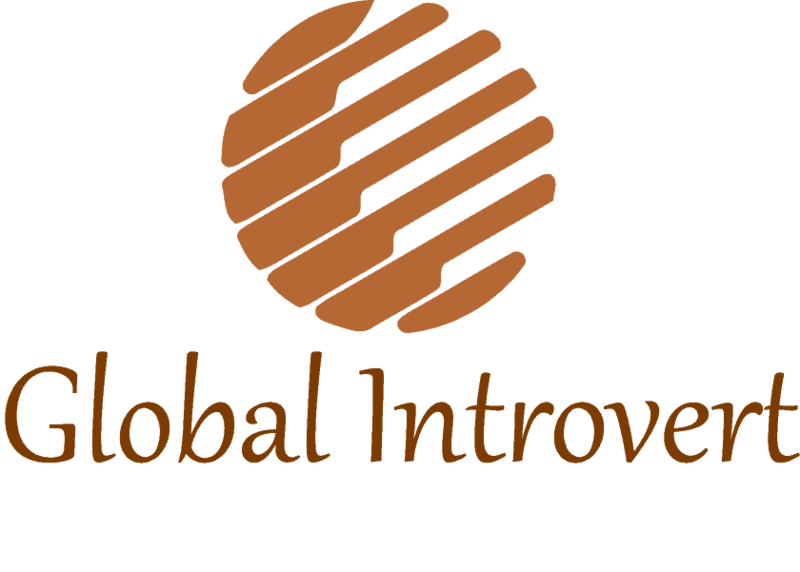 It also guarantees you get all the information on the footprints and can ask any question you want. Don’t worry, you’ll get plenty of time to take pictures afterwards. And the mandatory safety helmets will make you feel just like a real explorer! To complete the experience, the park includes a small museum, as well as some life-size dinosaurs to give you a feeling for the real thing. This part of the park you can roam around in on your own for as long as you like. 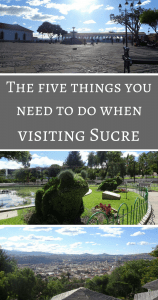 Have you been to Sucre? What else would you recommend? Do you agree that helmet makes me look like I’m getting all serious on that explorer thing? Share in the comments!